Also concept art, idea art, conceptualism. Only artists and collectives with pages on Monoskop wiki are listed. Robert Morris, Card File, 1962. Metal and plastic wall file mounted on wood, containing 44 index cards. 68,5 x 26,5 x 5 cm. Ed Ruscha, from Twentysix Gasoline Stations, 1963. 17.9 × 14 cm. Log, PDF. Conceptual art emerged from the confluence of two major legacies of modernism, one embodied in the readymade, the other in geometric abstraction. Through the practices of Fluxus and the Pop artists, the first legacy was transmitted to younger postwar artists; through the works of Frank Stella and the Minimalists, a similar bridge was between prewar abstraction and conceptual approaches at the end of the sixties. At the beginning of the decade, prior to the organized onset of Conceptual art in 1968, the fusion of Fluxus and Pop had led to works such as Robert Morris's Card File (1962) and Ed Ruscha's Twenty-Six Gasoline Stations (1963), in which certain positions that would subsequently determine Conceptual art were firmly established: in Ruscha's work this meant an emphasis on photography and the form of distribution of the printed book; in Morris's, it entailed a focus on a revised, linguistic definition of modernist self-reflexiveness—or art asserting its own autonomy through strategies of self-reference—which Morris pushed to the point of undermining the very possibility of aesthetic autonomy. Both Morris and Ruscha are, in turn, indebted to the way Duchamp's readymade had yielded a more complex model of practice in the hands of Jasper Johns and Andy Warhol. These two were also central to the subsequent unfolding of photographic and textual strategies as they were being put in place in the mid-sixties by the first "official" generation of Conceptual artists, namely Lawrence Weiner (born 1940), Joseph Kosuth (1945), Robert Barry (1936), and Douglas Huebler (1924-77). These artists formed the group that was shown in January 1969 in New York by the art dealer Seth Siegelaub (1941-2013). The second element that contributed significantly to the formation of a Conceptual aesthetic was Minimalist abstraction as embodied in the work of Frank Stella, Ad Reinhardt, and Donald Judd. In his manifesto-like essay "Art After Philosophy" (1969), Joseph Kosuth acknowledged all of these as predecessors in the development of the Conceptual aesthetic. What is at stake in this aesthetic is a critique of the modernist notion of visuality (or "opticality"), here defined as a separate, autonomous sphere of aesthetic experience. What is further at issue is the question of the problematic uniqueness of the art object as well as the new mode of distribution (the book, the poster, the journal) and the "spatiality" of that object—namely, the pictorial rectangle or the sculptural solid (despite Minimalism's embrace of industrial production and technological reproduction, Minimalist work had ultimately remained wedded to the singular object). I interpret LeWitt’s aesthetic theory as opposed to Kosuth's. Whereas the latter's is characterized by a rational mode of artistic production that affirms the centered and authorial artist—the decisionmaker from beginning to end—LeWitt’s theory proposes a mode of production that is opposed to rationalism; the work is produced following a logical sequence that does not require intuition, creativity, or rational thought. Thus the work reads without the testimony of the privileged artist; this process of production is fundamentally, in a word, irrational. Furthermore, consistent with his rational standpoint, Kosuth’s aesthetic theory clearly restricts viewing experience to two possibilities: the viewer either comprehends the idea, or does not. As he states polemically in a 1969 interview, "The public’s not interested in art anyway. ... No more interested in art than they are with physics." In contrast, LeWitt's model of conceptualism posits an unlimited public. The content of artworks produced following this model is more than the private history of the artist and allows a multiplicity of readings. In this respect, whereas Kosuth formulates an aesthetic theory based upon the epitome of positivist thinking—the tautological model—LeWitt's aesthetic theory references positivism only to break out of it by introducing the subjective dimension of the beholder. "Once out of his hand,” LeWitt writes, “the artist has no control over the way a viewer will perceive the work. Different people will understand the same thing in a different way." In 1998, Silvia Kolbowski asked 22 artists to describe conceptual works from the period 1965-75, which they personally witnessed at the time, without mentioning author names or titles of works. The resulting video recordings were exhibited and text transcriptions were published in the journal October in 2000. 0-9, 6 numbers, eds. Bernadette Meyer and Vito Acconci, New York, 1967-1969. Reprint. , . FSL. , , ccindex. Art-Language, 19 numbers, eds. 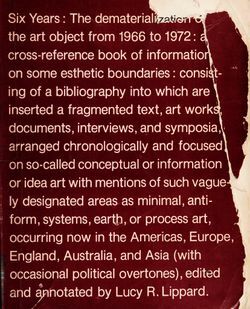 Terry Atkinson, David Bainbridge, Michael Baldwin, Harold Hurrell, et al., Coventry, UK: Art & Language Press, 1969-1978. 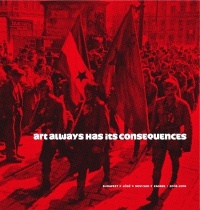 First issue carried the subtitle The Journal of Conceptual Art. 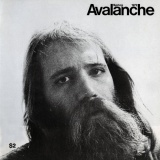 Covers, , . The Fox, 3 numbers, eds. Sarah Charlesworth, Michael Corns, Preston Heller, Joseph Kosuth, Andrew Menard, Mel Ramsden, and Ian Burn, New York, 1975-1976. ccindex, . Vision, 5 numbers, ed. Tom Marioni, Oakland, CA: Crown Point Press, 1975-1981. Issue 1. , , . Red-herring, 2 numbers, eds. Karl Beveridge, Jill Breakstone, Ian Burn, Carole Conde, Michael Corns, Preston Heller, and Andrew Menard, New York: C.I.F., 1977-1978. ccindex, Allen. 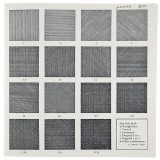 Sol LeWitt, Four Basic Kinds of Straight Lines, London: Studio International, 1969, 36 pp. Artist's book. Sol LeWitt, Four Basic Colours: Yellow, Black, Red, Blue, and Their Combinations, 1971. Joseph Kosuth, Art as Idea as Idea, 1967-1968, Brussels: Paul Maenz, Mar 1973,  pp. Catalogue. Art Journal 42(2): "Words and Wordworks", ed. Clive Phillpot, 1982. Tendencije 5, Zagreb: Galerija suvremene umjetnosti, 1973. Exh. held 1 Jun-1 Jul 1973. See also catalogues of retrospective exhibitions. For publications on individual artists and collectives see their respective pages. Lucy Lippard, Six Years, 1973, JPG, PDF (129 mb), Log. Julie Ault, Alternative Art, New York 1965-1985, University of Minnesota Press, 2003. Ian Burn, "The Sixties: Crisis and Aftermath", Art & Text 1, Victoria, Autumn 1981, pp 49-65. Jeff Wall, "Marks of Indifference: Aspects of Photography in, or as, Conceptual Art", in Reconsidering the Object of Art, eds. Ann Goldstein and Anne Rorimer, Los Angeles: Museum of Contemporary Art, 1995, pp 247-267; repr. in The Last Picture Show: Artists Using Photography, 1960-1982, Minneapolis: Walker Art Center, 2003, 32-44. Jacob Stewart-Halevy, "California Conceptualism's About-Face", October 163, Winter 2018, pp 71-101. Camiel van Winkel, During the Exhibition the Gallery Will Be Closed: Contemporary Art and the Paradoxes of Conceptualism, Amsterdam: University of Amsterdam, 2012, 273 pp. Published as book by Valiz, Amsterdam, 2012. Annotated bibligraphy, Stanford U Libraries. 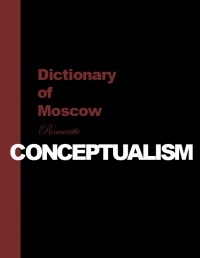 Andrei Monastyrsky, Dictionary of Moscow Conceptualism, 1999/2010, PDF, HTML. Moskovskii kontseptualizm, 2005, PDF, Log. Boris Groys (Борис Гройс), "Ekzistentsialnyye predposylki kontseptualnogo iskusstva" [Экзистенциальные предпосылки концептуального искусства], 37 (samizdat) [Машинописный журнал "37"], No 12, Leningrad, 1977. Bibliographies on Moscow Conceptualism page, ed. Sergey Letov. 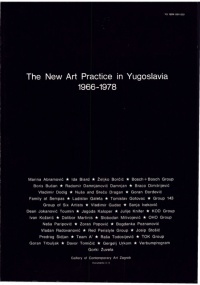 The New Art Practice in Yugoslavia, 1966-1978, 1978, Log. Klaus Groh (ed. 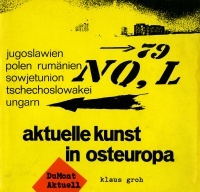 ), Aktuelle Kunst in Osteuropa, 1972, Log. Art Always Has Its Consequences, 2010, Log. Anna Markowska, "Permafo 1970-1981: Zbigniew Dłubak, Antoni Dzieduszycki, Natalia LL, Andrzej Lachowicz", pp 13-101. Sešit pro umění, teorii a příbuzné zóny 10 & 11 & 12, Prague: VVP AVU, 2011. Proceedings from the conference Důsledky konceptualismu [Implications of Conceptualism]. 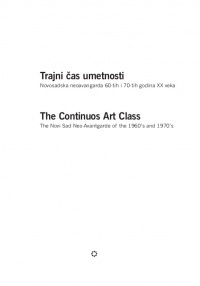 The Continuous Art Class: The Novi Sad Neo-Avant-Garde of the 1960s and 1970s, 2005, Log. Vivid Radical Memory, conceptual art in Hungary of the 1960s-70s, ed. Miklós Peternák & C3. Moscow Conceptualism, ed. Vadim Zakharov. 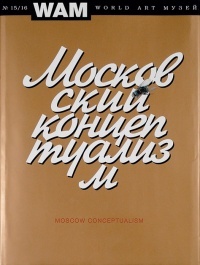 Moscow Conceptualism, ed. Sergey Letov. In & Out of Amsterdam: Travels in Conceptual Art, 1960-1976, MoMA, 2009. Digitizing Ideas: Archives of Conceptual and Neo-Avantgarde Art Practices, a joint project initiated by the Museum of Contemporary Art Zagreb, which involves the Museum of Contemporary Visual Arts from Vojvodina, Modern Gallery in Ljubljana, and Museum of Modern Art in Warsaw. Forgotten Heritage, 8,000 works of selected artists of the Polish, Croatian, Estonian, Belgian and French postwar avant-gardes. Launched 2018. This page was last modified on 13 January 2019, at 15:30. This page has been accessed 113,094 times. The content is available under fair use.